ACE library report “a disappointment” – BookSeller. “Library campaigners have expressed intense disappointment with the Arts Council (ACE)’s first strategy document on libraries. with one claiming it is not “devised to meet people’s needs”… Desmond Clarke says it advocates replacing paid staff with volunteers, Tim Coates says it missed a lot of important research – “There is no consciousness about the real issues that matter, books, operations, opening hours, and you have to have been living on another planet not to know what these issues are.” – CILIP are in discussion with ACE but fear lack of funding. On the other side of the counter at Winsford Library – Voices for the Library. Hannah Bailey, libraries officer for UNISON spends a day with library staff. “Meanwhile on the counter, a constant stream of people were coming in and out, putting paid to the rumour that nobody uses libraries anymore. Remember earlier this year when John Redwood MP made some startlingly ill-informed comments about libraries after a brief visit to one? Anyone deeming themselves worthy of comment needs to spend at least a day in a library before drawing any conclusions. After all, a visit to an uncharacteristically quiet supermarket at 10pm wouldn’t lead one to conclude that modern retail as we know it is dead would it?”. [Disclaimer – Winsford Library is the branch that I manage]. Dorset – Campaign group: Dorset for Democracy. Newham – Campaign group: Save our language papers. Oxfordshire – Campaign group: Save Old Marston Library. “Friern Barnet Library, Hampstead Garden Suburb Library and North Finchley Library are under threat of closure in the London Borough of Barnet. 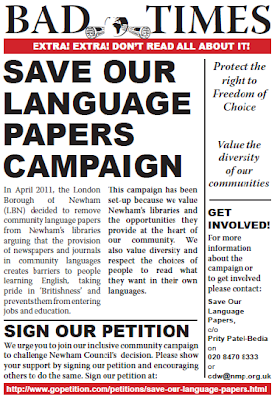 Consultation has closed and Friern Barnet and Hampstead Garden Suburb are set to close 31 Dec 2011 unless local campaigners come up with an acceptable community option to saving the services provided at these libraries.” Barnet – Email to PLN. “We all need to do our bit for society; I (like many others nationally) have been giving up hundreds of hours to ensure we keep our small library running a normal service. Time I could have spent with my baby girls & wife. It has actually cost me time & money. I’m sorry to say this but you & the rest of the Taxi users in OCC are becoming a parody of fair play & decent public spirit. You all seem to want a BIG society but not actually get involved. Let me remind you people have lost their jobs, are losing their public services & you have “not the slightest intention of getting on a bus or a tube train”?” Oxfordshire – From our Oxfordshire correspondent – Alan Gibbons. Council spends £25k per month on private transport for councillors. Print article This entry was posted by Ian Anstice on September 22, 2011 at 10:24 pm, and is filed under Uncategorized. Follow any responses to this post through RSS 2.0. You can skip to the end and leave a response. Pinging is currently not allowed.